Brittany Ferries is a French ferry company which operates ferries between Britain and France, Britain and Spain, and Ireland and France. The company was founded in 1972, and at first the only sailings available were between Roscoff (Roscoff Property Guide) and Plymouth. It wasn't long, however before new routes were introduced. The company has now expanded and improved its fleet and its routes to become the premier ferry company operating between the UK and western France. The company offers a good spread of departure ports along England's south coast, allowing you the options to depart from Plymouth, Poole or Portsmouth. The possibility of choosing a convenient departure point cannot be underestimated, particularly if you own a holiday property in France and have to make frequent journeys between the two countries. Brittany Ferries offer a good choice of destination ports too, with the widest choice of mile-saving cross channel routes. Many people who own property in France have come to dread the time consuming and energy sapping driving hours that follow a lot of ferry crossings, so it makes sense to minimise this by taking advantage of Brittany Ferries' excellent routes. You will also find that you save money on road tolls as well as fuel costs and wear and tear on your vehicle, helping to off-set the initial cost of the ferry. Portsmouth to St-Malo: The lovely port of St-Malo (St-Malo Property Guide) is a great starting point for a visit to Brittany (Brittany Property Guide), or to the Loire (The Central Loire Valley Property Guide) or the popular Poitou-Charentes (Poitou-Charentes Property Guide). Plymouth to Roscoff: This route is great for those wishing to access Brittany and the Atlantic coast (The French Atlantic Coast from Biarritz to Southern Brittany). Portsmouth or Poole to Cherbourg (Cherbourg Property Guide): This gives good access to Normandy (Lower-Normandy Property Guide, Upper-Normandy Property Guide, eastern Brittany and northern central France. Portsmouth to Caen or Ouistrehem (Caen Property Guide): Excellent for those wanting to access Paris (Paris Property Guide), Normandy and destinations in central France. Plymouth to Santander: Brittany Ferries is the only company to operate this route, with the fastest crossing between the UK and Spain, allowing unrivalled access by sea to the north-west of Spain and the south-west of France. Brittany Ferries can also lay claim to having the most modern fleet on the Channel, thus offering a touch of luxury that will get you to your destination in style and comfort. A fully French crew add flair and flavour to the service that is most enjoyable, and bound to get you in the mood for the good life ahead on arrival! The ferries themselves are extremely well appointed, more in the manner of cruise ships than the rather utility style of the usual cross channel ferries. Brittany Ferries' travellers are also offered the possibility of a comfortable cabin on overnight crossings, allowing you to arrive refreshed and relaxed and without feeling that you have wasted your precious holiday time in transit. 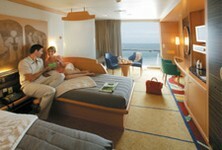 Brittany Ferries offer a great choice of accommodation onboard. The actual accommodation varies from ship to ship, but across the fleet you will find a choice of two or four berth inside or outside cabins, couchettes or reclining seats. Some of the ships offer an even more luxurious option, with Commodore or De Luxe cabins available onboard. Those of you who have to travel with young children will be pleased to know that cots can be provided on request. Passengers with mobility problems or other special needs can also be catered for, and there are a number of specially adapted cabins. Due to limited availability, however, it is wise to contact the company in advance of booking to discuss your particular requirements. If you really want your holiday to start onboard your cross channel ferry and you appreciate a little luxury, you can't do better than to treat yourself to a Commodore cabin. Best described as a floating hotel room, the Commodore cabin rivals the comfort and style of many a top class cruise liner. A spacious Commodore cabin has twin beds (not bunks) and a recessed extra bed or sofa bed as well. The cabin is fully air-conditioned, has an en suite wash room, tea and coffee making facilities, mini bar and even a DVD and TV for your personal onboard entertainment. All Commodore cabins have a porthole, and on overnight sailings you can enjoy a complimentary breakfast to set you on your way. What's more, if you happen to have chosen to sail on the Pont Aven you will find not just a porthole to look out of, but a balcony! Brittany Ferries and the "Property Owner's Club"
Brittany Ferries have put together a package which should be of considerable interest to those who make regular trips to visit their own property, or to seek property in France. On payment of a registration fee and membership subscription, you can enjoy privileges that include a saving of up to 30% on travel fares, up to 10% off your meals and wine ordered in the onboard restaurants, and a breakfast allowance on overnight sailings. You will also be offered discounts off any promotional offers run by the company at the time of your booking, together with a guest discount that can represent up to a 15% saving. An additional unique opportunity is that you can advertise your letting property through Brittany Ferries' own brochures, which are proven and highly effective advertising mediums that target the right market for your gîtes (Owning Gîtes and Chambres D'Hotes (B&Bs) in France). 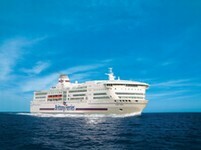 To join the Property Owners Travel Club just visit the Brittany Ferries website at www.brittanyferries.co.uk. Brittany Ferries - how many ships are in the fleet? Brittany Ferries has a modern and dedicated fleet of eight at your disposal. All of Brittany Ferries' vast experience of the requirements of cross channel customers have gone into the development of a fleet that is second to none, and answers individual needs as well as providing choices to suit most situations and pockets. The flagship, the Pont Aven, is a superbly equipped and appointed luxury vessel, with facilities such as an onboard swimming pool, cabaret and children's entertainments, cinemas and promenade decks. There is a good selection of quality restaurants and other dining choices, with a team of top French chefs and other professionals employed, to make sure that the food served is a worthy part of the Brittany Ferries experience. The classic part of the fleet includes mv Barfleur, mv Bretagne, mv Mont St Michel, mv Normandie and mv Pont l'Abbé. The Pont l'Abbé is due to be replaced in 2008 by the new ship L'Armorique, currently on order from a Helsinki shipyard. At a cost of £81 million, this ship is said by David Longden, MD of Brittany Ferries, to be part of Brittany Ferries' "ongoing plan to become not only the most modern, but also the most comfortable fleet on the channel". Finally, there are the two high speed vessels, the catamarans Normandie Vitesse and Normandie Express. Brittany Ferries offer more than just luxurious crossings between the UK and France or Spain. The company has put together packages of complete holidays in France and Spain, effectively removing all the hassles of finding suitable accommodation and transport arrangements from you. The range of holidays is extensive and includes golfing holidays, outdoor activity holidays, camping holidays, pet friendly holidays and hotels and gîte holidays within its choices. Non French speakers can benefit from the English-speaking helpline that operates all day, every day. Apart from making life easier for you, these holidays also have the distinct advantage of being fully bonded, providing real peace of mind for the traveller. Obviously the ferries are busiest in holiday times, with weekends, high summer and the times around Christmas being especially hectic and more costly. The quietest times to travel are usually on those ferries leaving the UK on Monday to Thursday afternoons, and those that depart from France in the early mornings on Mondays to Fridays. So if you are travelling to western France, whether it be Brittany in the north or Biarritz in the south, why not consider Brittany Ferries? Though the costs may at first seem comparably high, the quality of the package that Brittany Ferries puts together for its customers is such that this is not seen as a disadvantage. And if further proof of the excellence of Brittany Ferries should be required, you need to look no further than the prestigious Telegraph Travel Awards. Brittany Ferries have just been voted best ferry company in the hotly contested 2007 competition. The company's commitment to a programme of investment and dedication to producing a top quality service is clearly reflected (and rewarded) in this success. Brittany Ferries has come along way since its inception and early days as a vehicle for transporting the "Onion Johnnies" (the legendary French farmers who peddled their onions and garlic from strings around their necks as they pedalled their bicycles to the markets of southern England)! These days, Brittany Ferries are a great choice for the discerning traveller, and the company looks set to go from strength to strength.